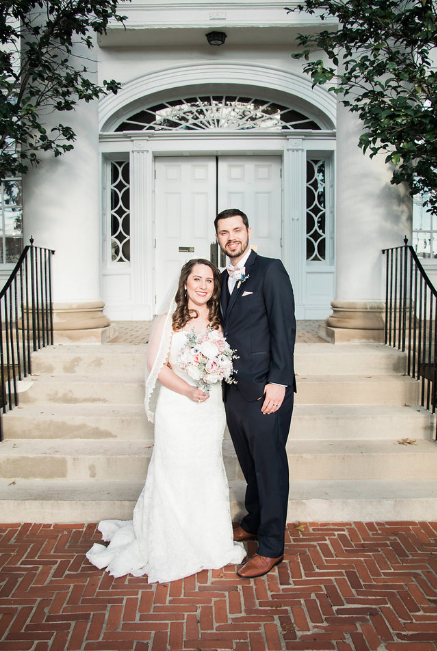 Built in 1834, the University Club in Tuscaloosa, AL exudes sophistication and charm, much like our feature bride Megan Clanton Angeloff of Franklin, TN. 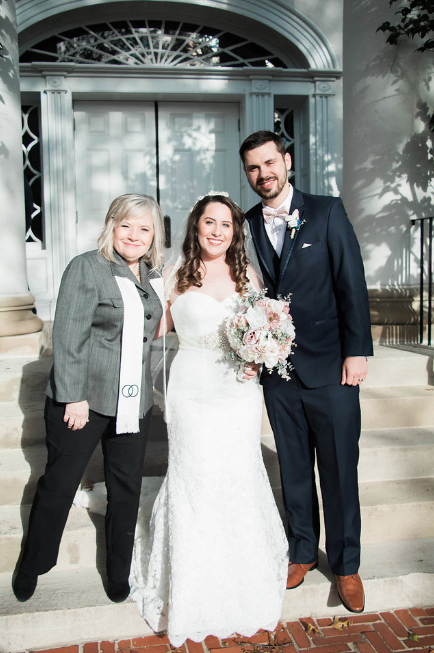 She and her groom chose this location for its historic architecture while it is also close to her heart as the University of Alabama is her alma mater. 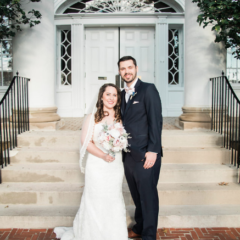 Megan and fiance, Jeffrey Angeloff, approached the day with much ease. 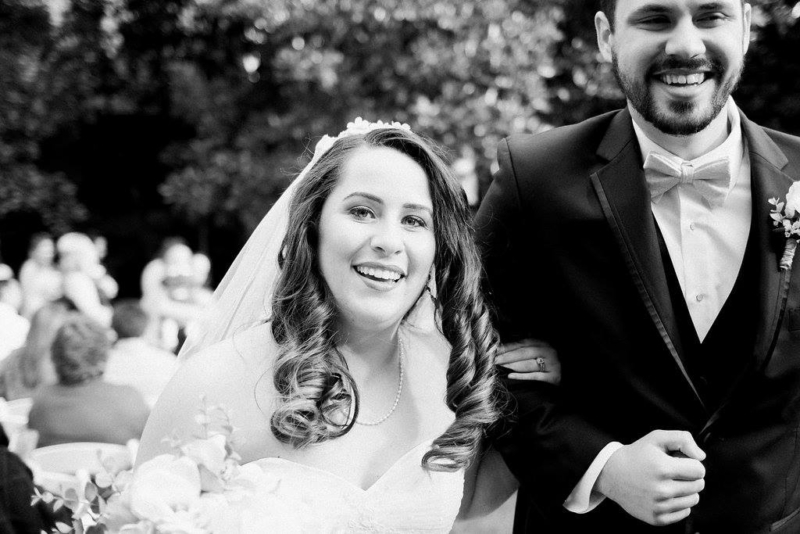 Their calm and simplistic demeanor showed how comfortable and sure they were of their union. What a delight to see! 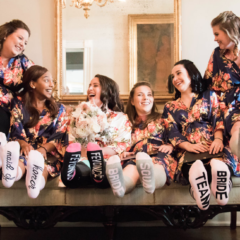 Megan’s approach for their wedding was also similar – simple, chic and romantic. 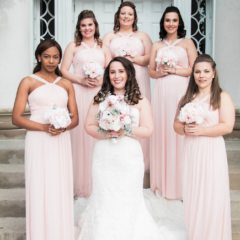 Her bouquets, designed by her mother,Vickie Smith and boutonnieres & corsages, done by her mother-in-law, Tammy Angeloff, were in shades of white, blush and mauve with touches of greenery such as succulents and eucalyptus. 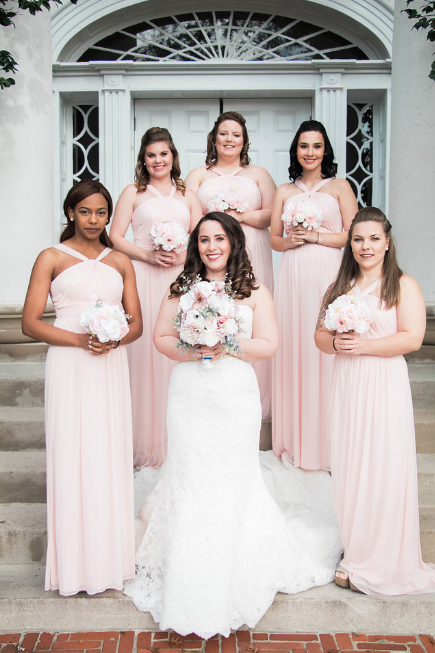 She was the true picture of a modern bride and chose an exquisite complimentary combination of blush and navy hues for the overall wedding scheme. 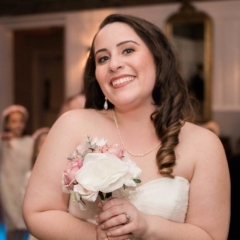 Her wedding dress had a sweetheart neck and gem and pearl detailing with a mermaid fit. The long train with lace was very fitting for the venue of choice. 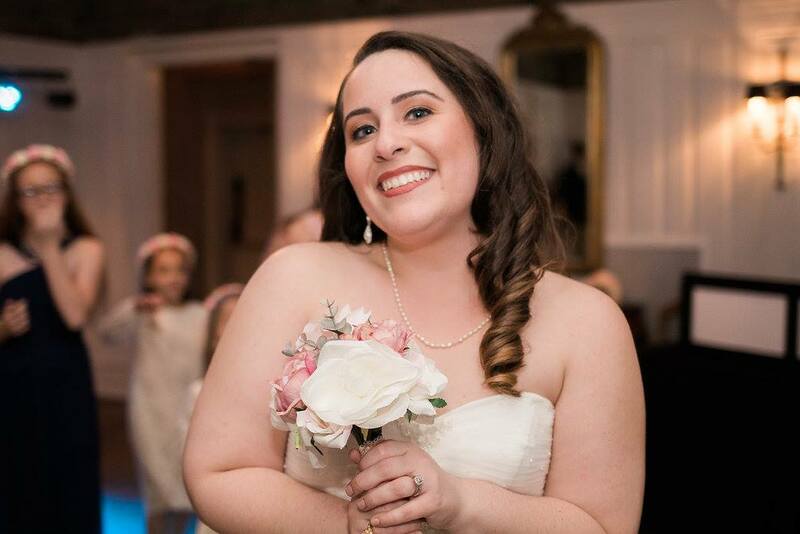 The bride walked into “Forever Like That” by Ben Rector. 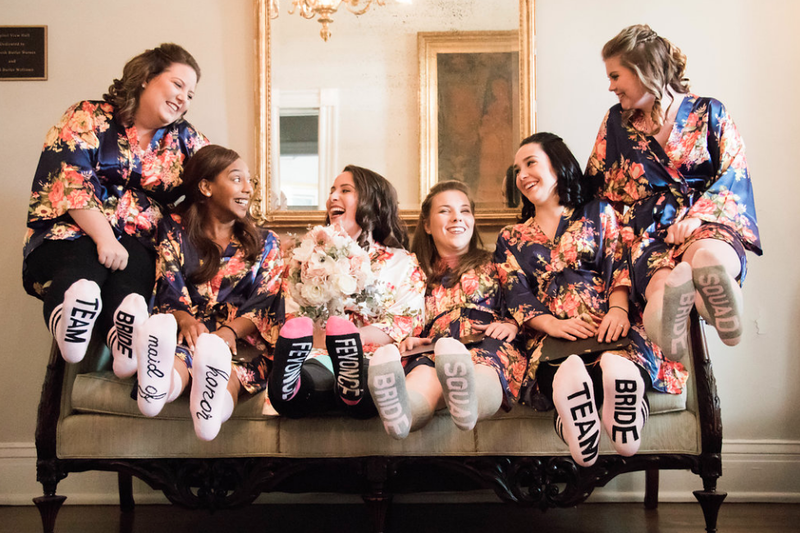 The ceremony was customized to reflect both of the couple’s personalities. 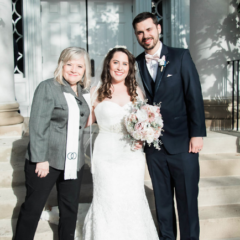 “She (Donna) made it our own story, and the vows were very well done and super special to us!” said Megan. The reception was kicked off with “Marry Me” by Train, and DJ’ed by Alan Freeman. Their reception was lively and full of music that their guests could dance to as were the couple’s wishes. The food tables were adorned with BBQ meatballs, sesame chicken kabobs, pulled pork sliders, grilled cheese and tomato soup shooters, a fruit platter and brie with strawberry jam. “Comfort food!’ as Megan said. 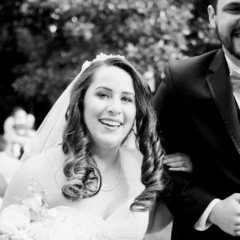 The couple’s wedding was full of love and anyone on the outside looking in could see this. Not just love between the bride and groom but among all the friends and family. From the flowers, cake and decor, their wedding was effortlessly curated by loved ones.